We are "cambelt specialists" The cambelt is one critical part that has a limited life and if ignored can lead to catastrophic engine damage. Ignoring its condition is tempting hospitalisation for your car along with unwanted surgeon's fees. 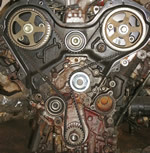 Cambelt replacement may seem like open-heart surgery but to us it's a daily procedure. We do this very efficiently and with care so it gets its full new lease of life. As with everything we do we use quality parts and also genuine if preferred. So don't just hope for the best, get a quick check up and well prescribe the right treatment if a cambelt change is necessary. Occasionally cambelts break as some people are just afraid of a check up. You could compare a broken cambelt to a minor heart attack. A breakage is very serious and you need to get it done before disaster strikes. Well fit a new cambelt and carry out other checks to ensure worry free motoring. Sometimes cambelt replacements need additional parts such as a tensioner, idle bearings or even a new water pump. We check these things as a matter of course, because a job half done, is no saving at all.